In 1999, the FAO Environment and Natural Resources Service published some global climate grids and various derived products like the agroclimatic production potential according to Lieth (1972) and maps of Koeppen climate classes (click here for details). Here we present updated versions of the global maps of net primary production (NPP) based on the most recent gridded data sets of temperature and precipitation (click here for details). Updated maps of Koeppen climatology can be found here. 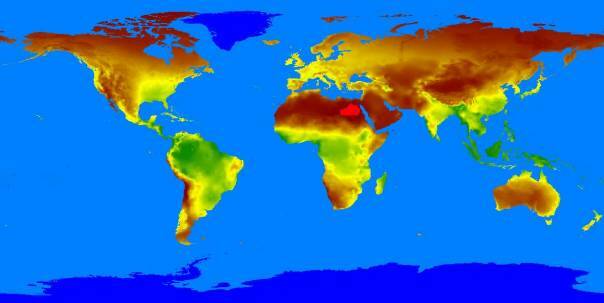 The Map shows NPP for the period 1951 to 2000 based on datasets from CRU and GPCP VASClimO. A larger version of the map can be downloaded here. For a short description of the net primary production according to the model of Lieth (1972) which became famous as the Miami model click here. We are providing NPP based on different data sets and for different periods to allow users to assess the differences as a function of the data source and period covered. As an example, a map of differences in mean NPP between 1951-1975 and 1976-2000 is shown. We are providing all data as tables of comma separated values for a .5°x.5° grid with seven columns containing gridpoint number, longitude in .01 degrees, latitude in .01 degrees, land fraction of the grid cell in %, NPP, NPP if precipitation were limiting (NPPP), NPP if temperature were limiting (NPPT). The following high resolution maps of NPP (5’x5’) are available as georeferenced IDA/Windisp grids only. Colour tables for the IDA images are here. A map of the limiting factor (precipitation or temperature) is provided here as IDA image and bitmap. It is based on the CRU and VASClimO datasets. Between the two periods pronounced differences in climatic npp appear in some regions of the world. The following graph shows the latitudinal dependence of these differences. It demonstrates that npp would have increased for most latitudes if temperature were the limiting factor. However, especially between 0 and 20° North the npp decreased because of its precipitation dependency. The latitudinal profiles are available for all datasets as comma separated values. The files consist of 6 columns each, containing latitude belt number, latitude in degrees, land area of the .5°-latitude belt in 1000 km2, average npp of the latitude belt, npp if it where temperature limited, npp if it where precipitation limited. High resolution images of the differences in npp between 1951-1975 and 1976-2000 are provided for the CRU/VASClimO dataset as IDA image and bitmap. According to the Miami model the sensitivity of NPP with respect to changes in annual mean temperature dNPP/dT and annual mean precipitation dNPP/dP can be calculated for each location on earth. Since for each location NPP is either temperature limited or precipitation limited only one of the sensitivities differ from zero. Sensitivity of net primary production NPP in g(dry matter)/m2/year with respect to changes in annual mean precipitation in mm/year. Red areas are not sensitive to precipitation changes given the current temperatures. Download this bmp (enlarged) or IDA image. Sensitivity of net primary production NPP in g(dry matter)/m2/year with respect to changes in annual mean temperature in °C. Light blue areas are not sensitive to temperature changes given the current precipitation. Download this bmp (enlarged) or IDA image. Lieth, H., 1972. "Modelling the primary productivity of the earth. Nature and resources", UNESCO, VIII, 2:5-10.